31/1/2019 Crossways Farm is offering a one or two-night romantic stay for couples this Valentine’s Day. … along with the Crossways Farm standard offerings of pillow chocolates, Egyptian cotton bed linen, luxurious breakfast, spacious bathroom with freestanding bath and essential oils, and exclusive use of the self-contained accommodation. You will be the only guests! Prices (total cost based on two people sharing a double room). Offer valid from 14th – 19th February 2019. Please contact me for longer stays. 24/12/2018 It seems only right that, having completed a year of weekly seasonal treasures, I should reflect on the reasons I began. Rereading the introduction I wrote a year ago, I was surprised. I had almost forgotten that I planned to choose one subject for each week of winter only, and I can barely recognise the emotions I was experiencing then, so different do I feel now. I started the project as a kind of therapy for winter, a way to help me live more in the moment and appreciate what was around me even when I was struggling, whether due to cold and dark, dealing with difficult circumstances or events, or my own inexplicable moods. I found the therapy so effective and enjoyable that I didn’t want to stop. 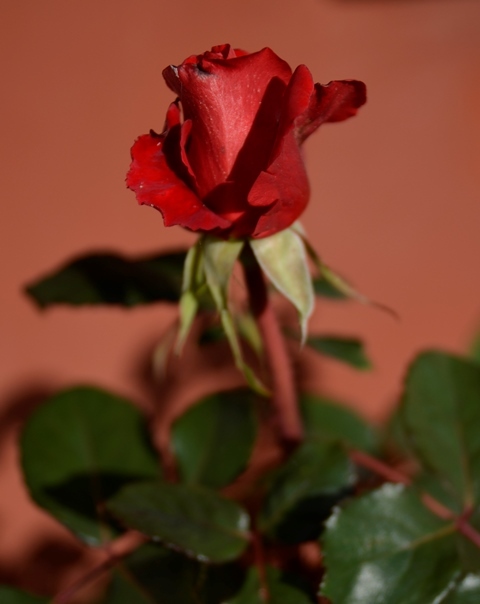 No matter what time of year it is, there are always times when we are so bound up with our busy-ness or daily problems that we can fail to notice things in front of us; forget to be grateful for simple gifts. I found that forcing myself to stop to think and write about them was so beneficial to my mental health, regardless of how low or upbeat I was feeling, that the original purpose of the task was overtaken by a multitude of positive effects. In this way it reminds me of my church tour which I began in April last year, for just three or four vague reasons. The outcomes so far, perhaps ten times that quantity, have been beyond anything I could have imagined. 23/12/2018 It took me months to attract the first goldfinches to the garden with nyger seeds. When they did arrive, I would see one, and then have to wait several weeks to see the next one. Still, I was thrilled with the odd sighting, and wished I could tell my father they were here. Like kingfishers, they look too exotic for England; and also like kingfishers, it only takes a glimpse to know which bird you have seen. 17/12/2018 When I first heard reports from friends and neighbours of bluebells sprouting in December, I thought they must be mistaken. I have rarely noticed snowdrop shoots in December, and that seemed far more likely than bluebells. With a large dollop of doubt and no first-hand evidence to settle the matter, I soon forgot about it. Until last year, when I actually paid attention to what was under my nose. 10/12/18 The sound of tawny owls isn’t restricted to autumn, or even to night time. They are usually not far away at any time of year, and a few years ago there was a period when I would hear them in the garden more often at about 11am than any other time of day. Recently I noticed I had been missing them. Autumn nights are not complete without that most magical of sounds: a sonic reproduction of alpaca wool. It is a sound I could snuggle in. What a contrast to the bird that produces it! Loose-feathered and beautiful as tawny owls are, I am under no illusion as to their cuddliness. One glimpse of those piercing eyes and deadly beak and claws instantly corrects any mistake on that front. Their babies are another matter, however. Perhaps the sound is of owlet fuzz rather than alpaca wool. It certainly has the same effect on me as looking at a photograph of a baby owl. 7/12/2018 Sometimes it can feel like a nuisance having to drive home in the dark as early as 4.30 in the afternoon. I don’t much like it, partly because so many people fail to dip their headlights that I often get home with a headache, not to mention experiencing several moments of panic as a result, when I can see nothing of the road in front of me. But then I realise there is something I love about going home in the dark. 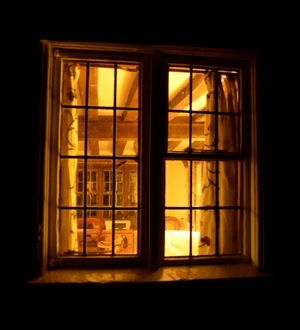 Seeing the little windows of old Suffolk cottages lit up is delightful. They are better than any Christmas lights, and last all autumn and winter. The occasional glimpse of beamed walls and wonky ceilings inside adds to the treat. Although I am out in the dark, they remind me how snug I will be once I get home. And it also somehow makes me feel as though I am in a story, wondering what all those people are doing inside in the warm. 5/12/2018 It’s strange. I’m enjoying autumn more than ever, and yet of all the seasons this year, I am struggling to choose subjects to write about. I have had many ideas, but few have lodged in my mind. I’ve been trying to figure out why. Since I got back from holiday, my autumn has been characterised by activity. A good proportion of it is seasonal – tidying up in the garden and lighting bonfires, splitting firewood, making jam, apple picking with goats (a sometimes inconvenient but certainly entertaining version of the activity), rushing to stew and freeze all the apples before they rot… Even those parts that aren’t exactly seasonal have benefitted from the darker nights and colder days: indoor activities such as planning refurbishments and repairs, decorating, tidying and sorting, finding time to work through an enormous pile of B&B ironing which I can never bring myself to do when the sun is shining (most days since late spring this year), and cello practice. There has been sociable fun too: concerts, meeting new people, going for walks with my neighbour, and inviting people round for tea or supper. 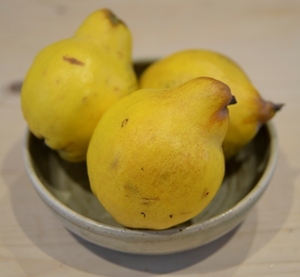 30/10/18 If I had to choose one thing that for me could represent – even conjure up – autumn, it would be the smell of quinces. There is something about smells. They seem to possess a power that sights, and possibly even sounds, don’t. They can transport me instantly to a different time and place; conjure up feelings, scenes and situations vividly and sometimes unexpectedly. Luckily there are few smells that do this in an unpleasant way – as dreams usually do, I find. Mostly smells bring good memories, or at worst nostalgic or curious ones. The smell of quinces not only represents for me childhood autumns in Suffolk, but is in itself intoxicating and addictive. I could put my nose to a quince and inhale over and over, all day long. Copyright © 2019 Crossways Farm. Powered by WordPress. Theme: Accelerate by ThemeGrill.